Community development is most effective and efficient when it is situated and led at the local level and considers the social behaviours, needs and worldviews of local communities. With more than eight out of ten people globally self-reporting religious belief, Religion and Development in the Asia-Pacific: Sacred places as development spaces argues that the role and impact of religions on community development needs to be better understood. It also calls for greater attention to be given to the role of sacred places as sites for development activities, and for a deeper appreciation of the way in which sacred stories and teachings inspire people to work for the benefit of others in particular locations. The book considers theories of ‘place’ as a component of successful development interventions and expands this analysis to consider the specific role that sacred places – buildings and social networks – have in planning, implementing and promoting sustainable development. A series of case studies examine various sacred places as sites for development activities. These case studies include Christian churches and disaster relief in Vanuatu; Muslim shrines and welfare provision in Pakistan; a women’s Buddhist monastery in Thailand advancing gender equity; a Jewish aid organisation providing language training to Muslim Women in Australia; and Hawaiian sacred sites located within a holistic retreat centre committed to ecological sustainability. 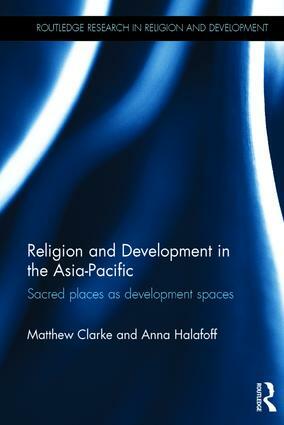 Religion and Development in the Asia-Pacific demonstrates the important role that sacred spaces can play in development interventions, covering diverse major world religions, interfaith and spiritual contexts, and as such will be of considerable interest for postgraduate students and researchers in development studies, religious studies, sociology of religion and geography. Matthew Clarke is Head of the School of Humanities and Social Sciences, Deakin University, Australia. Anna Halafoff is a Senior Lecturer in Sociology at Deakin University, Australia.